What size roll off container will best fit your needs? When will you start filling your container? What types of waste will you be tossing in your rented bin? But before we address those, let’s talk about some of the things that a customer should look for in a waste management company in Eldridge, Iowa. The first thing is that the waste company should be a local firm. Now what’s a local firm? A company with trucks, containers, and drivers that service the Scott County area. Some of the garbage companies that advertise on the internet are not local, don’t have trucks, drivers, containers, etc. Some of them are just waste brokers who take orders from unsuspecting waste generators and subsequently sub contract the work out to a local company after tacking on a fee. 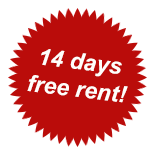 You don’t need the extra charge, the lost communication that comes with using a middle man, or the frustration of not knowing who to contact once you’re finished filling your rented dumpster in Eldridge. 6 cubic yard mini bin is ideal for homeowner junk removal projects. This size is also just right for small bathroom remodels or spring clean ups. 10 cubic yard size is capable of containing up to 20 squares of asphalt shingle roofing tear off. This size is also recommended for the disposal or recycling heavy waste materials such as concrete, dirt, cinder blocks, etc. 20 cubic yard roll off is a favorite of homebuilders disposing of wood, plastic, cardboard, and the waste arising out of new home construction or renovation. 30 cubic yard is the biggest dumpster size available for our Eldridge, Iowa customers. This bin has a backdoor which can be opened for access and easy loading heavy or bulky items. So when will you actually need to have your dumpster delivered to your Eldridge project? 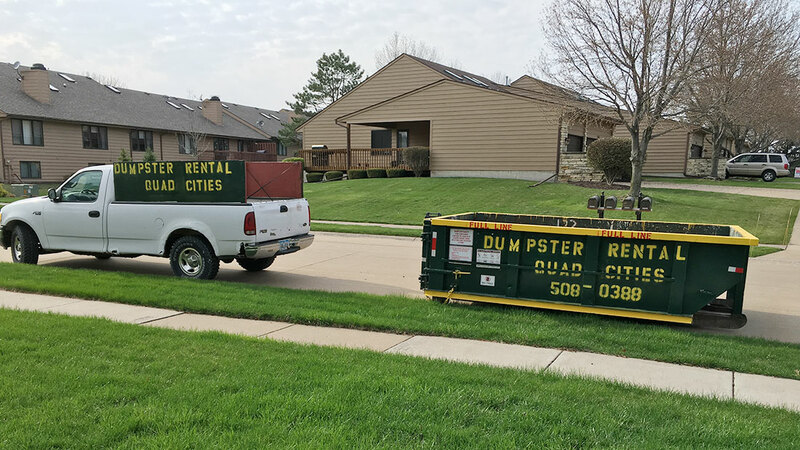 Dumpster Rental Quad Cities can not always promise a particular time of day for equipment delivery, but we can assure our customers they will receive their bin on the day we promise to deliver it. So you might want to have the delivery take place the day prior to actually needing to fill it. For example, if you and your crew plan to start loading waste on a Saturday morning, you might want Dumpster Rental Quad Cities deliver the bin on Friday. Now one of the first questions you’ll be asked when ordering a waste container is ”what will you be tossing in the dumpster?” Our friendly office staff ask this question because there are some waste materials which are banned from being landfilled. Electronic waste, appliances, computers, tires, yard waste, etc can not be placed in any trash container. Also there are some materials that can be placed in landfills, but can not be placed in large quantities in a dumpster as they will cause our vehicles to become over the maximum allowable highway weight limits. Dirt and concrete for example, can only be disposed of in out ten yard dumpsters. Junk Removal Service In Eldridge, Iowa- Why Call An Out-Of-Town 1800 Junk Removal Company When You Can Go Local And Save? Not enough space in the driveway or vicinity to have a full size metal bin. Maybe you just can not afford to have your car or driveway blocked for an extended period of time. Don’t want to load your own waste and would rather pay others to do the lifting for you. Junk volume, or lack of, doesn’t justify the use of a large container. Have some waste that can not be placed ion a dumpster, but can be recycled/processed by our junk removal crew. Tires, appliances, electronic waste can be collected separately by our junk removal crew. 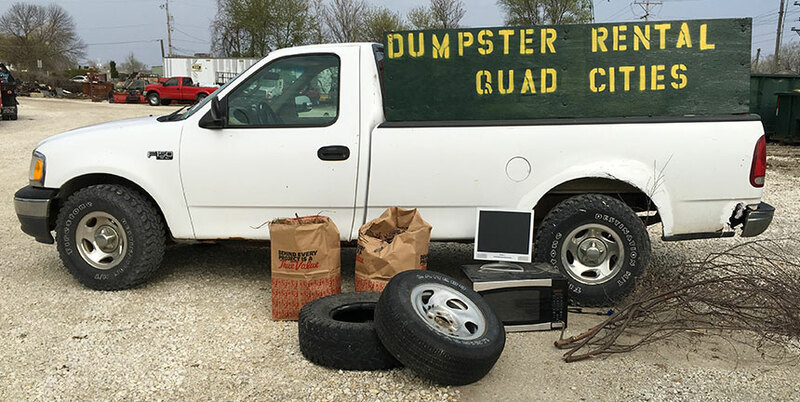 Dumpster Rental Quad Cities provides dumpster rental and junk removal services in Parkview, Iowa but there are more services provided by others. For example several local garbage companies provide garbage containers for Eldridge local business. Often times, these commercial services involve an automated or semi automated refuse collection vehicles servicing(dumping) waste bins on-site, compacting waste, and transporting the waste to area landfills. Weekly curbside collection of residential garbage occurs in Eldridge, Iowa and so does recycling services for residents. Often times, 90 gallon caters are used to contain waste and are serviced by rear load or side load garbage trucks with automated bin lifters. Some communities provide residential garbage collection under contract with a private waste collector. In other communities, residents must subscribe directly with a local garbage collection company to have their waste collected. And sometimes the municipality itself collects the waste within the city. There are a few landfills within driving distance of Eldridge. These landfills typically charge by the cubic yard or by by the ton for waste brought to them. Regardless of which landfill you plan on using, you should call ahead for prices, operation hours, and banned waste listings. Residential Dumpster Rental In Eldridge, Iowa- It happens more often than you might think. 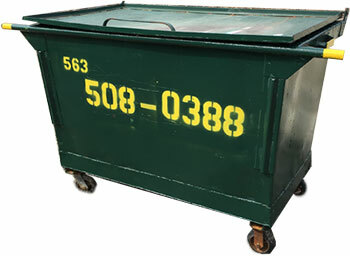 6 yard mini bins often used for spring or fall clean outs, junk removal jobs, small remodels, etc. 10 yard roll offs are usually used for small clean outs, but can also be used for the hauling of concrete for recycling. If you’re removing a concrete driveway or sidewalk, you might want to order this container and recycle the heavy material to save on the landfill disposal costs. 20 yard roll off dumpster is perfect for residential remodels or even new home construction. Roofers use this box for asphalt roofing shingle disposal as it holds up to 40 squares of single-layer shingles. 30 yard roll off is a big money saver when customers have large volumes of bulky waste to toss out. Cleaning a hoarder home? This is the right size box for and it has an opening back door for easy loading of bulky or heavy waste.